This is Part 13 of my continuing coverage of the legal plight of Bruce Aristeo of Camden, New Jersey that began with a relationship breakup and civil dispute with Jody Raines and subsequently escalated to the Camden County (NJ) Prosecutor’s Office. His trial begins in January 11, 2016. In an early interview with Bruce Aristeo, he mentioned that a Camden County Prosecutor offered a plea bargain deal to him. Because I had so many documents to read, study, and digest, I didn’t follow up on the plea bargain thread. I finally remembered to ask him what were the specifics of the plea bargain deals offered to him. I also obtained a copy of Tracy Cogan’s October 22, 2013 letter for the second plea bargain deal which was sent to Bruce after he fired the public defender and became a “pro se” (self-represented) defendant. The State’s plea offer in this matter is, in exchange for a guilty plea to third degree stalking, in violation of N.J.S. 2C:12-10c, two years probation, time served as of the date of the plea and mandatory fines and penalties. The remaining terms and conditions of the probation would be in the Court’s discretion. A guilty plea to stalking requires the entry of a permanent criminal restraining order, in addition to the Indefinite Temporary Restraining Order issued in Family Court, barring any contact with the victim in this matter, Jody Raines. In the alternative, the State would accept a plea offer to fourth degree stalking, in violation of N.J.S. 2C:12-10b, for 18 months probation, again time served as of the date of the plea and mandatory fines and penalties, as well as leaving the remaining terms and conditions of probation in the Court’s discretion. A conviction for fourth degree stalking also requires the entry of a criminal restraining order, in addition to the Indefinite Restraining Order issued in family Court, barring any contact with Ms. Raines. Interestingly, when Bruce was working with a public defender in July 2013, Tracy Cogan’s offer was much stiffer at five-years probation with immediate release, fines and penalties, one-year psychological evaluation and treatment, and a criminal restraining order. 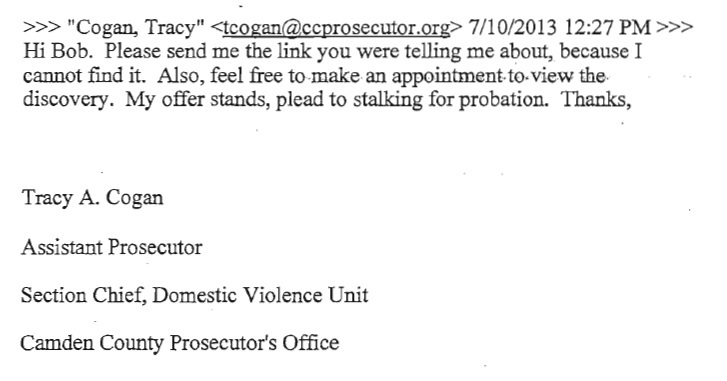 Three months later, in October 2013, Tracy offered Bruce (as “pro se” defendant) two alternatives to choose from. One option was third-degree stalking with two-years probation, time served, fines and penalties, and a criminal restraining order. The other option was fourth-degree stalking with 18-months probation, time served, fines and penalties, and a criminal restraining order. No psychological evaluation and treatment in either option. If I were in Bruce’s shoes looking at these options, they were all terrible options and would brand him a criminal for life. I don’t blame Bruce at all for rejecting these terrible options even if that meant him sitting in jail for six-months as he did. Bruce had previously and unwisely succumbed to legal pressure and agreed to the overbroad “indefinite” temporary restraining order (TRO) which was subsequently used as a blunt force legal instrument and stepping stone for his wrongful arrest and wrongful indictment over his YouTube videos. He smartly did not make the same mistake again and willingly agree to a criminal charge and a criminal restraining order (which would be added on top of the previous “indefinite” TRO). Tracy Cogan wants Bruce to accept the plea bargain deals to make his case go away. With Bruce’s trial only three weeks away (January 11, 2016), that does not seem likely to happen. This is painful to read. If this case is goes to trial, Camden County is subjecting themselves to a 1st Amendment fight and embarrassment. Someone needs to sit down with Tracy Cogan and tap on this Prosecutor’s temple. As I’ve said in my earlier comments, I have read nothing that was ever done or said off the Internet by Bruce Aristeo to Jody Raines. One can only imagine a worse caseload for the courts IF this kind of abuse is added to the backlog of frivalous lawsuit. Think of the power Linda Ellis would have been given if you (Matthew Chan) had caved in when the unlawful Permanent Protection Order was granted to her against you. You should write a post about your life post trial had you not won your appeal. You could have been jailed for 10 years if it were not for your gumption, relationships and our public outcry while you were forced in to verbal exile! What these dolts in the judicial system don’t understand is that most humans have friends. They can silence one person for a period, but they can silence supporters or the press for long. If our friends or even a stranger can be accused of a stalking with no evidence of stalking under the legal definition, then we are all subject to jail time. The good news is that a trial will mean that Bruce Ariseto’s story will be told. Hundreds more pages of testiimony and evidence will be revealed. I assume he will have the right to video tape the proceedings. We will report on all this new information. Looking forward to your continued reporting.